Hello everyone. Pleased to have found the site. 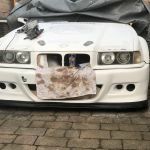 Have posted update on my new project on site Facebook page - MURDER ONE E36. Have moved along from lotus and a 135 engine S1 which was brilliant around knockhill to this whole new world of BHP.